I've had so much fun with the Livingstone's that I have saved it all up for one long story (well, not too long). We acted as special agents at their holiday club where I was guest of honour. I was introduced by Captain Tim and all 100 children said 'hello' to me - I felt very special! I was lucky enough to be invited to Ellie's tenth birthday party and boy did we have fun! There was a Mars bar fondue which was delicious, hair crimping (I wasn't up for that as I didn't want to get singed! ), music, mayhem and makeup - what a tiring day. We had a trip to Pizza Hut, a sleepover with friends, a ride on a pony and I was privileged to meet Jason's bear. oh you had such lovely adventures with Ellie and Oliver and the Livingstone family!!..... 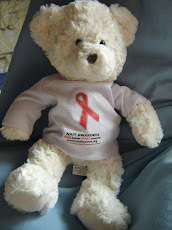 I loved reading all you have done, and your meeting with NAIT angel Jason's special bear made me shed a few tears....Have a safe journey little bear!